Spring is almost here, and with it a chance to transform various rooms in your house! This week the focus is on your kitchen, with a few projects that give the heart of your home a fresh new look. Now, as with any DIY project, a little work is to be expected, but it’s time to bite the bullet and just do it, because these ideas really make a difference. The first is installing a backsplash. You can be as elaborate, or as simple as you want with this. The beauty of a backsplash is that it can add color and texture to your space, all in one swoop. 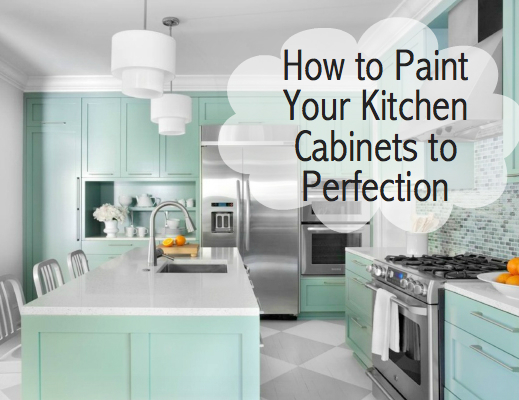 Keep in mind however, that the next project is painting your cabinets, so if you want to do both you should consider coordinating colors and styles prior to buying supplies for either. Then, it’s time for prep work. Before buying your materials i.e. tile, grout and tile adhesive, you must measure the dimensions of your backsplash area. You can determine the square footage by multiplying the length of the area by the width. Once you buy all the material you need, then it is time to get your hands dirty. Lay down cardboard or plastic tarp to keep your countertops from getting dirty or damaged. Then, put on your handy safety goggles and gloves, shut off power to all outlets within the backsplash area and remove the outlet covers. Clean the pre-backsplash surface with warm water and give it a few minutes to dry. Then, you’re ready for the fun part! Next, precision is key when laying backsplash tile. Apply tile adhesive with your trowel, being sure to only cover a small area at a time. This prevents it from drying out. However, be sure you do this in the very center of the area you are laying with tile. You can position the tile by using a twisting motion and then pressing down firmly to make sure it adheres properly. Add the remaining squares of tile in a methodical pattern around your starting piece, using spacers if necessary. Also, if you need to cut a section of backsplash tile, measure the length and width required, use a tile cutter to score it and a tile saw to cut away the area that will show. When tiling around outlets, be sure the edges will be hidden under the cover once it is screwed back in place. Finally, complete the job with finishing touches. Once all the tile is laid, be sure to wipe off any excess adhesive and ensure the lines between are cleaned and ready for grout. Once the adhesive sets completely, remove spacers if applicable, then prepare for grout application. Mix grout in a bucket per the manufacturer’s instructions. Use a rubber float in a 45 degree angle to the tile joints, working into the lines between the tiles in a sweeping motion. Then, once you allow the grout several minutes to dry, use a damp sponge to wipe off any excess. 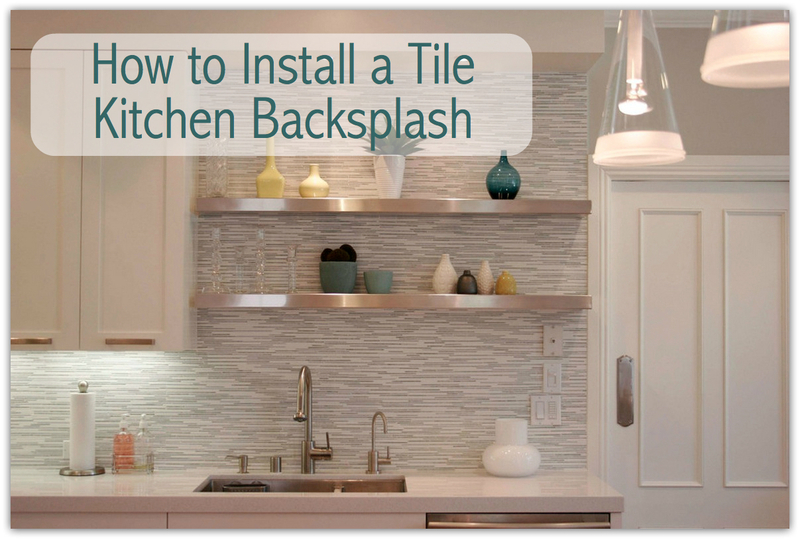 Repeat this until the backsplash area is visibly clean. Wait several hours before removing haze from the surface, once the grout is entirely dry and cured. Use a clean cloth, such as a cheesecloth, to wipe it clean. Over the next several days, mist the backsplash surface evenly with cool water. Replace the outlet covers once all the grout is dry. As a final measure, you may consider using a pH neutral sealant to protect the grout from water and stains. In addition, mildew-resistant caulk applied at the base of your backsplash, where it meets the countertop, is a suggested preservation measure as well. Heidi Hudnall is the current Marketing Coordinator at Runyon Equipment Rental. A graduate of Butler University with a double major in International Business and Marketing, Heidi writes articles that outline seasonal projects and answer frequently asked questions, making your DIY lifestyle more fun and easier than ever before. Feel brand new! Refreshing a room in your home –especially a bathroom- can be as easy as updating drawer pulls or a shower curtain, to installing new cabinetry, tearing out tile and starting all over again. Whatever your creative ideas –and your budget- can handle, here are a few ideas you can do in as little as a weekend to make your bathroom feel brand new. Below are nine ideas and tips for how to conquer a bathroom makeover. 1. Put some thought into your potty area. Make sure you’ve got everything you need for your remodel – paint, plumbing fixtures, tile, tub, toilet and special orders – before you take a hammer or Sawzall drill to your bathroom, so you can use it all the way up to the day you start the project. Your family will thank you! Plus, with all you need on hand you can estimate the extent of work, such as moving the plumbing lines or running new lighting wires, more accurately. 2. White is the new black. If you’re going to install new sinks, tubs or toilets, even surface tile, consider purchasing them in white. Manufacturers produce and sell more white bathroom fixtures than any other color, so they cost less than those potentially special-order varieties. Add splashes of color with low-cost accents, such as paint, furnishings, artwork, towels and other accessories. 3. Go to town with paint. Bold enough to transform a room, yet practical enough for a weekend project, paint is great for freshening up a bathroom. Mold- and mildew-proof primers and paints are not only good for walls and ceilings, but for refinishing cabinet doors and hardware or towel racks and other fixtures. There are even options for painting over tile and other ceramics. Create a spa environment with watery blues, greens and neutral colors; even white does the trick. Use an airless sprayer for overall coverage and protect any painted designs with two coats of clear polyurethane. Learn more about using an airless paint sprayer here. 4. That old thing is new again. Repurposing old furniture for a bathroom adds personality, not to mention, storage with character. Turn an existing sideboard or dresser into a vanity by cutting a hole in the top for a drop-in sink and faucet. Add a freestanding chest of drawers for storage. Install vintage shelving in smaller bathrooms. Comb salvage yards for vintage tubs, sinks, countertops, flooring, benches and other unique finds. 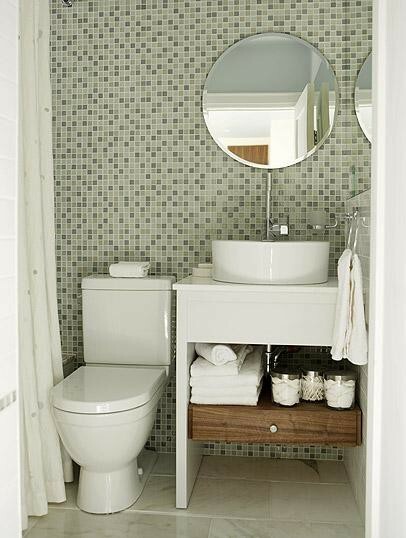 Using tile as an accent can add a punch of color in the right places. Even though glass tile can be expensive, you don’t need a lot of it to create a dazzling effect. Use a tile cutter to cut up larger tiles or break old tiles with a hammer to create your own mosaic designs. Apply colored gout quickly with a grout hand pump, adding an extra layer of design. Add interest to a wall by running a tile border vertically, instead of the usual horizontal accent. You can also add texture to walls by using beaded board. Use an air stapler to install panels, which look as authentic as individual beaded boards, are lightweight and less expensive. Think of the lighting as architectural interest, too – change outdated fixtures with new lights made especially for bathrooms and have a purpose. Recessed lighting over the shower for better illumination, Hollywood lights around a mirror for romance, even a floor or table lamp for a boudoir feeling. 6. Reflect a new image. If your medicine cabinet looks like it belongs on the set of Mad Men, replace it by hanging a framed mirror or two, making the room seem larger. Some mirrors are made to tilt away from the wall, which adds functionality. If you plan to remove the floor, use a faster, simpler technique: rip up the floor from the underlayment – the layer of material next the subfloor. Set a circular saw blade just deep enough to cut through the floor covering and the plywood underlayment. Then cut into small sections, making removal easier. Afterwards, install a new underlayment of quarter-inch plywood or cement board and install the new floor on a clean surface. 8. Simple does it best. Use basic tools like an air nailer, stapler or screw gun and make short work of easy updates like installing a new toilet seat, towel bars or toilet paper holder, replacing a standard shower rod with a curved one, adding pullout shelves to deep cabinets or changing out an old shower head with a new handheld sprayer. Even replacing the countertop is a simpler job with the right tools – if your vanity is in good condition. 9. Out of your comfort zone? Call a pro. With any home project, do-it-yourself mistakes can cost you big time. If you need the help of an electrician, plumber, carpenter or mason for your bathroom update, call one. If you have questions or comments for us, please utilize our section below or the contact us page on our website. We’re here to help! Right now, you may be sitting in your cozy living room watching television, but wondering why your feet are freezing. Perhaps that perpetual draft in the family room has you always putting on a sweater, or three. If you’re feeling air leaks in your living space, imagine what’s escaping through your attic and basement! You may think your home is air tight, but the fact is, quite a lot of heat (or air conditioning) is leaking out through those little gaps and cracks all over the house, especially in unheated areas. This is costing your family precious energy, not to mention, big bucks. Sealing off air leaks is a relatively easy task to accomplish, once you find them. Below are 10 places you can look. Once you determine where your house may be experiencing air leaks, you can look to a variety of methods for plugging up these leaks in the most cost effective and timely manner. Depending on where a leak is and the severity, there are certain options most suited, per below. What Plugs Air Leaks Quickly? 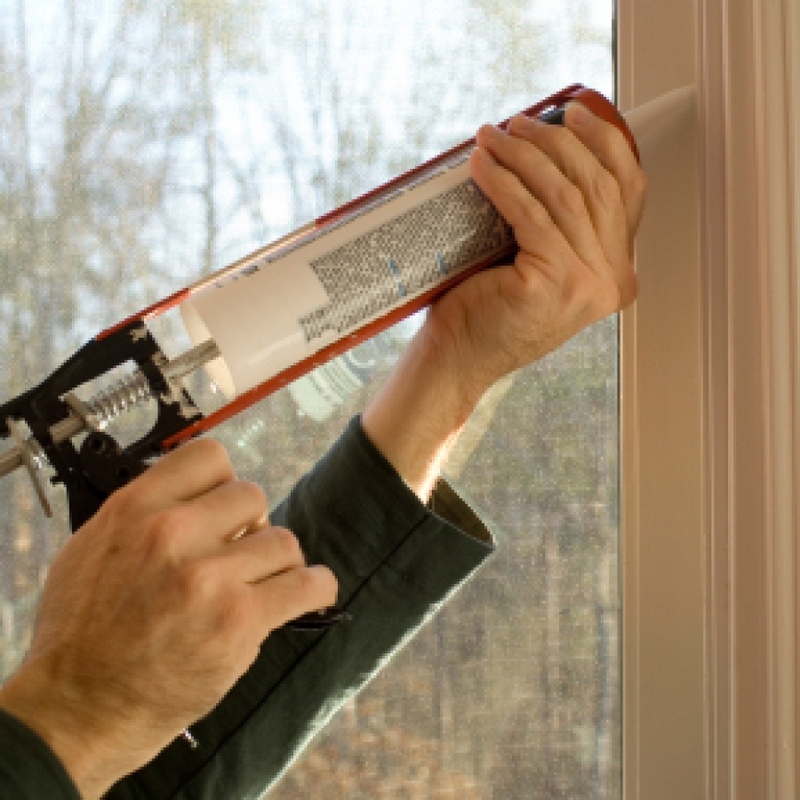 Caulk fills gaps best that are less than 1/4-inch wide, such as those cut around electrical boxes and cable wires, and can be used anywhere around the house. Use silicone caulk with nonporous materials like metal flashing and in places where temperature extremes exist. Acrylic latex caulk cleans up with water. Sometimes, you may need to remove old caulk before running a new bead. A sealant saw removes sealant, caulking and glazing putty as well as damaged acrylic or silicon sealants quickly, saving you time and effort. Low-expansion polyurethane foam in a can is great for plugging openings 1/4-inch to three inches wide, like those around plumbing pipes and vents in the basement or attic. Weather-stripping and foam weather-stripping can alleviate air leaks around doors and windows, including the attic access door, pull-down attic stairs and the inside door to a basement or garage. You can also seal the attic door with caulking, or you can buy a pre-insulated hatch cover kit. If a draft comes in at the bottom of a door, install a new door sweep. Unfaced fiberglass insulation stuffed into plastic garbage bags, a critical step for efficiency, can block air leaks behind knee walls, above dropped ceilings, soffits and open stud cavities. For large gaps, use scraps of drywall or pieces of reflective foil insulation. Aluminum flashing can close the gaps created between wood framing, metal flues and brick chimneys due to building code requirements. Seal the flashing in place with high-temperature silicone caulk. An airtight baffle can insulate recessed lights that are not labeled ICAT, for “insulation contact and air tight.” Look for the label next to the bulb; if you don’t see one, assume the light leaks. Remove the bulb, push the baffle up into the housing, and replace the bulb. As always, contact us for more information if you are having an air leak problem, or comment below. Stay warm and cozy this winter, fix those leaks now before your energy bill gets too high! [Restore & Renovate] This is the second installment of an informative series on making structural repairs to your home. Find the first here. Drywall, also known as wallboard, plasterboard, gypsum board or sheetrock, is that durable, sensible material covering nearly every wall and ceiling in your home. It is prevalent in most rooms, including your finished garage or basement, and even the attic storage area. Drywall damage is relatively easy to fix using just a few tools and skills you’ve probably already mastered, such as sawing, drilling, sandpapering and painting. The trick is to repair and conceal holes and other damage so no one can tell. There’s the rub! However, if you learn the right way to repair holes in drywall, your walls will always look good as new. Drywall – for making repairs, buy a smaller amount such as 2′ x 2′ section, in the correct thickness for the repair. Most interior walls use ½-inch drywall; ceilings may use 5/8-inch. Setting or Patching Compound (Mud) – a powder that you mix with water, which dries very hard with little shrinking. The compound is sold with different set times calculated in minutes, so choose one that works for you. Adjust these steps to the size of the drywall damage. 1. Clean up the damaged area by brushing away pieces of paint or drywall and evening out the edges of the hole with a file or sandpaper. 2. Cut the hole into a square or rectangle using a drywall saw, so it’s easier to work a new piece of drywall in its place. Good-to-know tip #1: Before cutting or drilling, be sure you won’t hit pipes or electrical wires inside the wall. 3. Attach a backer board such as plywood or a scrap board inside the hole using a drywall screw gun and screws in each corner, countersinking each one. 4. Cut a new piece of drywall that fits into the hole. 5. Cover the joints and edges with tape using a mud taping tool or by hand, or spread spackling compound with a putty knife. Good to know tip #2: wash or wipe away excess compound between putty knife swipes to insure a cleaner patch job. Also, don’t let the knife cut into the drywall paper. 6. Mix a batch of setting compound and apply the first coat with a drywall knife. Use thin coats to eliminate a lot of sanding and mess. Once the first coat is set, continue applying compound, feathering out until the patch is as smooth as possible. 7. Sand the surface smooth using a drywall sander, removing any dimples or ridges. Good-to-know tip #3: it’s better to use too much compound that not enough – you can always sand down smooth. Also, damp wiping is cleaner than sanding, but use sparingly and let the paper covering dry thoroughly before sanding. 8. Prime the area with primer because compound takes paint differently than drywall does. 9. Paint the patch using paint that is matched to the wall color. Good luck with all your DIY in-home repairs – you’ll be glad you took the time! And as always, if you have questions or comments please utilize our section below or the contact us page on our website. [Restore & Renovate] This is the first installment of an informative series on making structural repairs to your home. Right about now, you may be thinking more about checking into a nice resort for a long weekend getaway rather than checking up on all the pipes and duct work in your house. But, in the middle of this stormy winter, it’s a good idea to take a look before you go, so the house is in perfect working order upon your return! Pipes and ducts are your home’s veins and arteries, allowing water and air to flow where they’re needed, nourishing its life-space. With the extreme winter weather Central Indiana is experiencing, a DIY homeowner doesn’t want to take any chances with frozen water pipes that could burst, or energy-depleting leaks in furnace duct work or dryer vents so full of lint; they could start a fire. Below are a few ways to alleviate the stress, so your home can relax. Locate the freeze. Feel along the pipe for cold spots. Open the hot water side of the faucet, if the hot water line is frozen, and vice versa. Opening the offending faucet can help to alleviate pressure in the line. Move the heat gun steadily along the pipe. Depending on where the frozen pipe is located, a hair dryer or a heater positioned closely can also do the trick. Leave the faucet open for several minutes when water begins to run again, to clear away any ice. Turn the water off and inspect for damage or leaks. In the case of a leak or burst pipe, shut the water off at the main valve. Patch the leak or hole, then replace the pipe. Let Faucets Drip – before temps drop low, open faucets of pipes prone to freezing enough to let water drip slowly. The continuous flow is the best prevention. Insulate – water pipe insulation is inexpensive and readily available at your local hardware or at your local home supply center. The round lengths can be cut to size and slipped over a pipe using a slit along one side. Install Heat Tape – considerably more expensive than insulation, heat tape is wrapped around exposed pipes and plugged into a household outlet. Follow manufacturer’s instructions. The furnace, the thermostat and the duct system – together, they deliver heat throughout your house, so you want them working at peak efficiency. Age and unnoticed damage can cause any one of these workhorses to stumble. You’ll most likely need to crawl under the house, but it will be worth it. 1. Conduct an inspection, either by yourself, or hire a licensed HVAC contractor to do it for you. Turn the furnace on, so air can move through the ducts, making it easier to hear and feel any leaks. Bring a powerful, cordless light and follow each duct passage from the furnace to its end. Mark any areas needing repair with flagging tape, so you can find them easily later on. Look and feel for loose joints, gaps in fittings or duct boots. Note where support straps are missing or sagging, which impede airflow. Find areas where insulation is missing and where the ducts are resting directly on the ground, which can also cause moisture-related problems. Inspect the large sheet-metal box attached to the top or bottom of the furnace where the ducts originate, called the plenum. Make sure it’s fully insulated and all ducts are well sealed at the connection points. 2. Make repairs. A basic repair kit includes a hammer, tin snips, utility knife, cordless drill, some short sheet-metal screws, a roll of metallic foil duct repair tape and duct strapping. Repair loose joints in solid sheet metal ducting using sheet-metal screws, then seal with foil tape. Flexible ducts typically use a clamp system to secure joints. Sometimes the original clamp can be reused; otherwise, use a large worm-drive or flexible plastic clamp to secure, re-wrap insulation and seal. Attach duck strapping to a solid support using nails or screws, and secure the ducts up off the ground. 3. Insulate the ducts using R-8 or R-11 insulation – in cold climates as well as warm, so heated and air-conditioned air is not lost. The best defense is a good cleaning of the entire dryer/vent hose/venting system, and for this you may want to purchase a special dryer duct cleaning kit, which includes a set of brushes made especially for this type of cleaning. However, a good vacuum and attachments, along with some cleaning brushes can work in a pinch. Try using a long handle 20″ gong brush or long handled scrub brush. Unplug the dryer and pull it away from the wall. Remove the lint trap filter, remove the screen by pulling it straight out and clean it gently with a fine bristled brush. Vacuum the lint trap-housing cavity, where the filter goes. Extend a brush with a long flexible handle all the way into the bottom of the cavity. Then, twisting gently, pull out the brush with the clumps of lint. Repeat until no more lint is revealed. Disconnect sections of dryer vent and remove lint build-up on the sides with a stiff brush at the end of an extender using circular motion. Repeat on all vent sections, until they are free of lint. Reassemble dryer ducting, plug in the dryer, move it back in place and replace the lint trap filter. [Infographic] Do You Know Which Heater is Best for Your Needs? With such cold, harsh weather this winter, portable heaters are a hot item. However, there are a lot of options to choose from, whether it be outdoor, indoor, electric, kerosene, etc. The following infographic aims to differentiate which factors are important and how to decide the type of heater best for your needs. Once you determine which heater/s you need for your home, jobsite, event, etc., visit our website for more details on what we have available for rent. If you have additional questions, please contact us or comment below. Stay warm this winter! Heidi Hudnall is the current Marketing Coordinator at Runyon Companies. A graduate of Butler University with a double major in International Business and Marketing, Heidi writes articles that outline seasonal projects and answer frequently asked questions, making your DIY lifestyle more fun and easier than ever before. 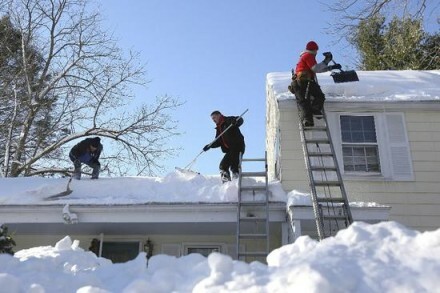 How is your roof holding up during this crazy winter season? Especially in colder climates like ours, roof damage can occur easily from stormy weather and extreme temperature changes. Your shingles are going to take the brunt of wind, snow, ice, even rain – sometimes, all in one day! So don’t wait until you see water stains inside on the living room ceiling before you investigate if your roof is safe, sound and stress-free. When you know what certain weather conditions can cause, you can determine what preventative measures or repairs you may need to get done, and pronto. This means you can improve your property in the spring, instead of spending time and money on costly repairs that are too far gone for DIY repair. Below are three major causes of roof damage and the steps you can take now to prevent extensive issues. 1. Extremely Heavy Snowfall. Piling snow adds extra weight on the roof structure, and too much weight can cause the roof to sag, leak or worse. Choose the next good-weather day and clear snow from the roof. Bundle up, use a ladder to climb up and brush snow away with a broom or shovel. Like any debris, snow tends to collect in crevices and places where melting moisture can break down the shingles, or prevent water from flowing off the roof and into the gutter system. Check for leaks that may have already formed. Common places where roof leaks can start include flashing, chimneys and skylights. It’s also a good idea to check for moisture seepage inside, at the attic level. 2. Ice Buildup. 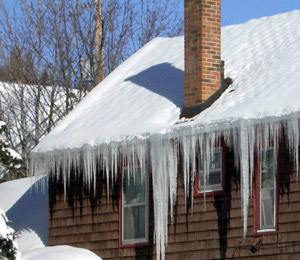 Fluctuating temperatures can cause heavy ice on the roof to melt, re-freeze and accumulate, causing ice dams that prevent snow melt and water from draining down the gutters properly. This can result in shingle damage and more leaks. Break up ice dams with an ice pick or a shovel. Just as you would with snow, clear the roof of ice thoroughly. Applying ice melt can help. Clear the gutter system of ice too, making sure the entire system is in good condition and drains are unobstructed. Consider having the attic properly insulated and vented so heat from your home cannot escape through the roof, keeping it at a temperature that avoids conditions where ice damming occurs. Learn more about attic insulation here. 3. Wind Storms. Relentless wind can cause shingles to crack, bruise, blister or simply blow away. Fix shingle damage immediately with the right tools. You’ll need new shingles, shingle nails, a hammer, a pry bar or shingle remover and protection for your hands and face. Loosen and pry away the remainder of a damaged shingle, including the nails (which may need to be cut with a hacksaw or utility knife). Fit and hammer a new shingle in place. 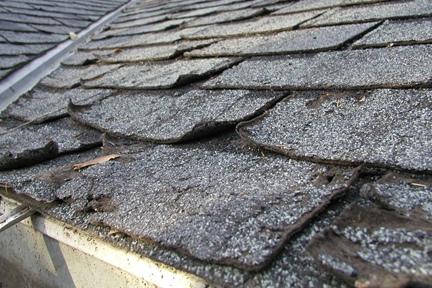 Learn more about shingle replacement and repair here. Good luck with all your DIY roof endeavors – you’ll be glad you took the time! And as always, if you have questions or comments please utilize our section below or the contact us page on our website.